2018 Dated Snowman | Jim Shore Ornaments Figurines | One Price Low Flat Shipping! From the Jim Shore Heartwood Creek Holiday Collection, Dated 2018 Snowman Disc Ornament. Made of hand-painted stone resin. Measures 3" tall. Comes with hanging cord attached and packaged in collectible Enesco Jim Shore gift box. Treasure the memory of this years Christmas with a dated keepsake ornament. 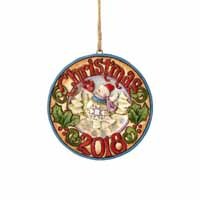 Beautifully handcrafted in Jim Shores unique folk art style, the 3 stone resin design features a whimsical snowman and his chirpy feathered friend and the ornament has carved in red letters CHRISTMAS at the top and 2018 at the bottom. This disk ornament makes for a memorable gift-topper or stocking stuffer.